At this they wept aloud again. Then Orpah kissed her mother-in-law goodbye, but Ruth clung to her. Ruth is the leading character in this book, which is named after her. The name Ruth means “mercy.” The story shows that God’s grace and mercy extend beyond Israel to include all peoples. Ruth can be read as a drama in four acts, with a prologue and epilogue attached. The prologue tells us how Naomi, her husband and two sons went to Moab, where her sons married. Eventually, Naomi’s husband and sons died, and she decided to return to Bethlehem in Judea (1:1-7). In the first act, Naomi tells her Moabite daughters-in-law, Orpah and Ruth, to stay in Moab. Orpah eventually agreed, but Ruth refused to leave Naomi and accompanied her to Bethlehem (1:8-22). 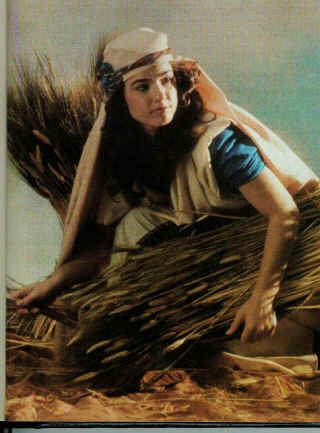 The next act sees Ruth gathering barley in the fields of Naomi’s relative, Boaz, who showed special concern for Ruth (2:1-23). Of all the articles on this website, this one is the fourth most popular, in the number of times it is recommended to a friend. Perhaps you know of someone who’d like to hear about it. If so, go to the bottom of the page and click on “Email this page.” Fill out the form, and share the good news! There’s also a way to share the page on Facebook, Twitter, Buzz, and other websites. The third act takes place at the threshing floor where, at Naomi’s instigation, Ruth hides until Boaz falls asleep and then quietly lies down by his feet. When Boaz awakes, Ruth expresses her desire to marry him according to the custom of the kinsman-redeemer. But Boaz tells her that another man has a prior claim (3:1-18). Finally, at the city gate, the other relative renounces his claim, and Boaz marries Ruth (4:1-12). The epilogue relates Naomi’s joy at this turn of events and then lists some of Ruth’s descendants, including David (4:13-18). In stark contrast to Judges, the book of Ruth shows us a community that did what was right in God’s eyes. It is “the story of God’s grace in the midst of difficult circumstances. Ruth’s story occurred during the time of the judges — a period of disobedience, idolatry, and violence. Even in times of crisis and deepest despair, there are those who follow God and through whom God works. No matter how discouraging or antagonistic the world may seem, there are always people who follow God. He will use anyone who is open to him to achieve his purposes” (Life Application Bible, NIV, Introduction to Ruth). Our fascination with the characters of Ruth, Naomi and Boaz notwithstanding, “God is the primary actor in the drama” (Edward F. Campbell, Jr., Ruth, The Anchor Bible, Vol. 7, p. 29). Even though human beings are free moral agents, God’s unseen hand directs events to accomplish his purpose, transforming Naomi’s sorrow into exultant joy and rewarding Ruth’s commitment to Israel’s God and community with an enduring place of honor in its heritage. In Boaz, we see a foreshadowing of the redemptive work of Jesus Christ. “Ruth’s inability to do anything to alter her estate typifies absolute human helplessness (Rom. 5:6); and Boaz’s willingness to pay the complete price (4:9) foreshadows Christ’s full payment for our salvation (1 Cor. 6:20; Gal. 3:13; 1 Pet. 1:18, 19)” (The Spirit-Filled Life Bible, NKJV, Introduction to Ruth). steadfast love: According to rabbinic tradition, the main theme of Ruth is steadfast love (Hebrew: chesed, meaning “faithfulness born out of a sense of caring and commitment”). All the main characters in the book — Ruth, Naomi and Boaz — acted with chesed. Excerpt: What does it mean to “repent”?